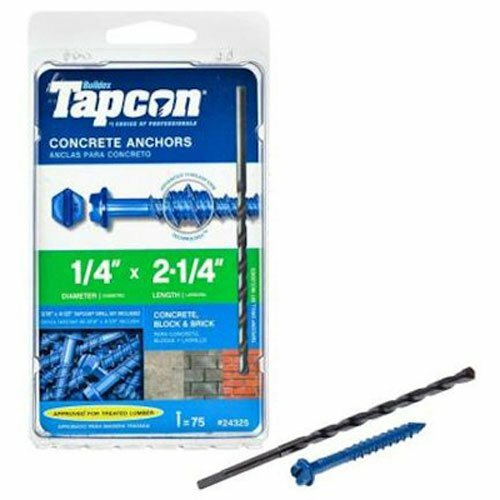 Concrete Screws or "Tapcons" are great for screwing into concrete. 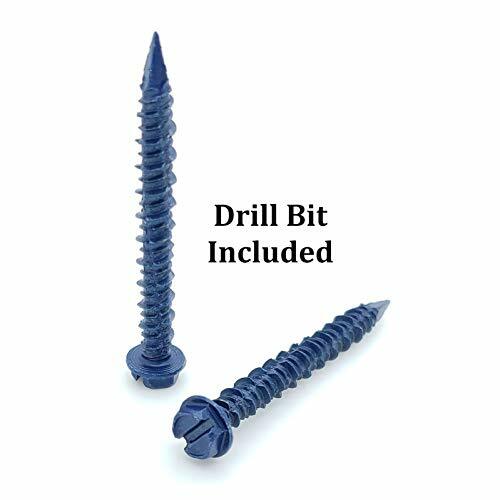 Included masonry drill bit is 3/16" size. Used to anchor signs, fixtures to concrete and block buildings. These Concrete Screws have received Product Control Notice of Acceptance (No. 15-0930.14) from the Miami-Dade Department of Regulatory and Economic Resources, certifying that they meet all Miami-Dade Requirements. Any time concrete comes in contact with water, it faces a life shortening processes. In cold climates, water that seeps into a drilled hole, can freeze and cause cracking. In warm climates, water inside a hole allows for mold to grow. Both situations can cause the screw to corrode, cracking, and ultimately premature failure of the structure. 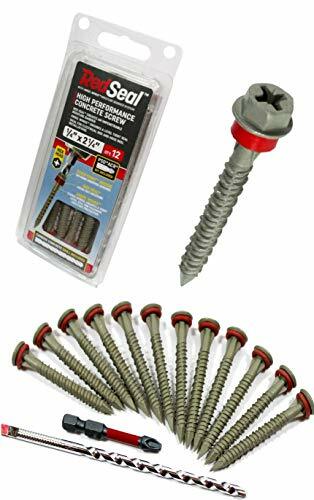 Red Seal Concrete Screws are High Performance moisture barrier protection screws. They are the perfect solution for light duty concrete installation jobs such as installing electrical boxes, hose reels, or anywhere you are seeking to prolong the life of your concrete slab or structure. 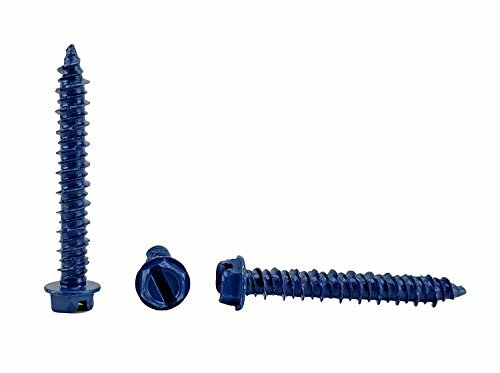 Each screw comes with a proprietary long-lasting silicon washer pre-installed that prevents moisture from entering. Use it in places where you want to keep moisture in or out. Each screw features the patented Stick-Tight drive system that allows for one-handed anti-wobble installation. The screw prevents moisture damage via "Angel Wings" and the patent-pending Red Seal washer system. Angel Wings under the head of the screw ensure that debris is cleared from the hole so that the Red Seal washer can create a tight moisture barrier. 1. Use the included bit to drill a pilot-hole. 2. Using the included driver bit (or a #2 Phillips or #2 Square Drive) install the screw. Installation is fast and simple and provides for a clean long-lasting installation that maximizes moisture protection and prolongs the life of your project! The maximum fixture thickness or the maximum thickness of the material being fastened for a anchor is 3-1/2" to 4". This will ensure that the minimum embedment of 1" will be met. 1. 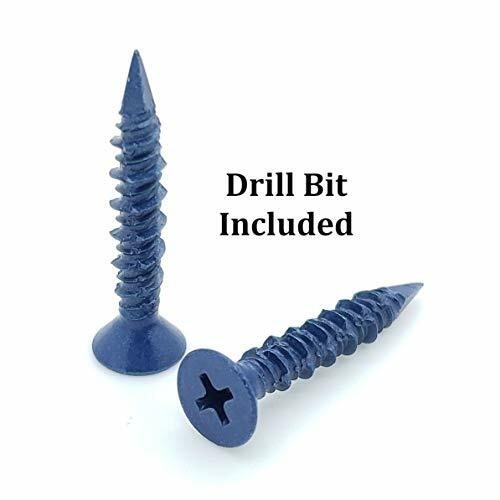 Use the included 3/16" bit to drill a pilot-hole. 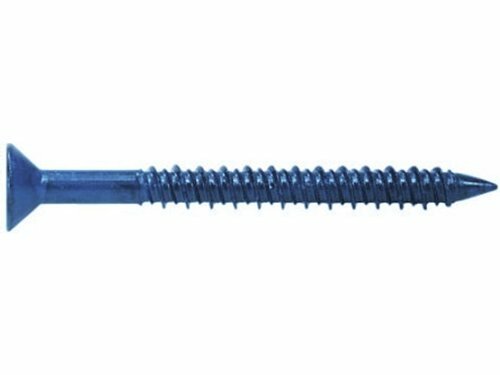 MKT Fastening steel conset masonry screw anchor. Commonly known as "Tapcon". Made of high strength steel for use in all types of solid and hollow masonry, wood and stone. Fluorocarbon coating offers high resistance to corrosion; costing withstands 1000 hour salt spray test. Cuts its own threads; hex head version offers 2 drive methods. 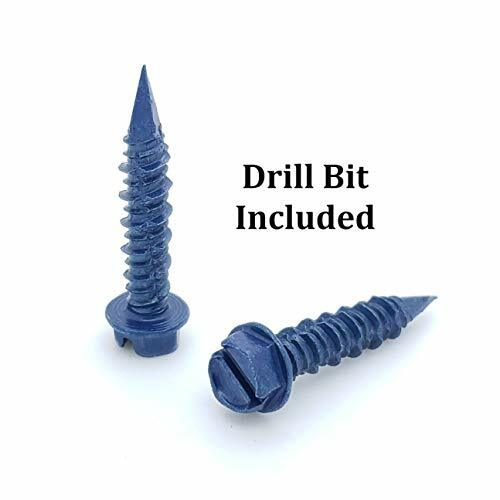 Fast, easy installation; drill bit included in each box. Softer base materials require undersized bits for best results. 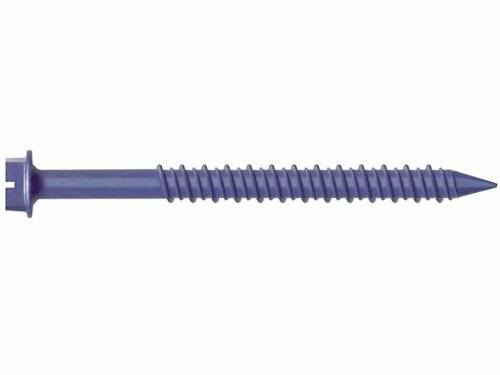 Corrosion resistance and long lasting performance due to the EnviroSeal blue coating. Deep threads provide superior holding strength. Great for anchoring items to concrete, brick, block, or other masonry materials. The diamond tip allows for superior penetrating into hard materials. 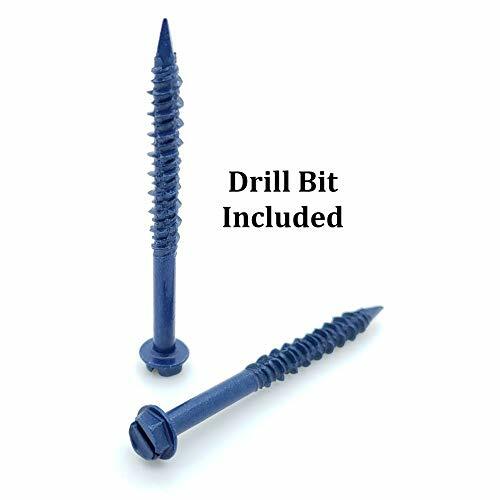 Package includes 100 screws and 1 masonry drill bit. 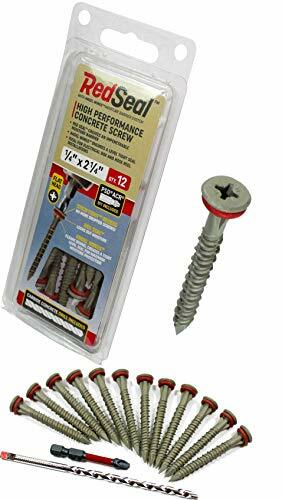 The Ansen Tools AN 113 Diamond Tip Phillips/Flat Head Concrete Screw Anchor with its Diamond Tip is designed for the most precise penetration in extra hard materials. 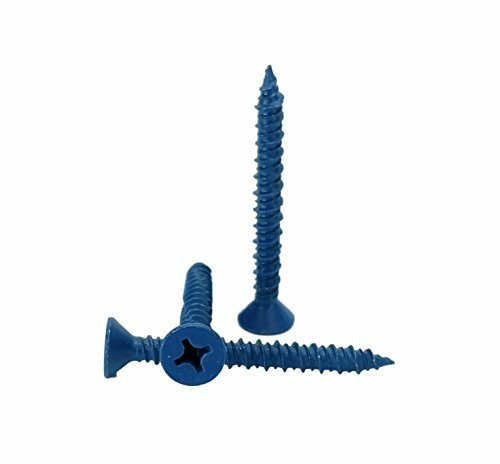 The screws are made from high-grade hardened carbon steel with the advanced plating process; Envirocoat, which provides lifetime corrosion resistance. 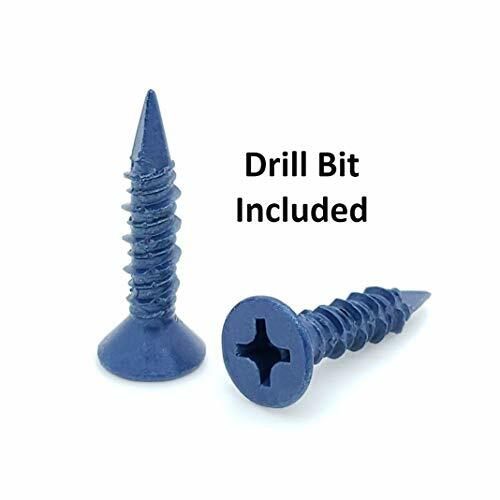 Drill bit included for pilot hole in concrete. Screw anchors are ICC Listed for Quality Control (see report ER-5045). Box comes with 100 screw anchors and carbide tipped drill bit. Concrete Screws or "Tapcons" are great for screwing into concrete. 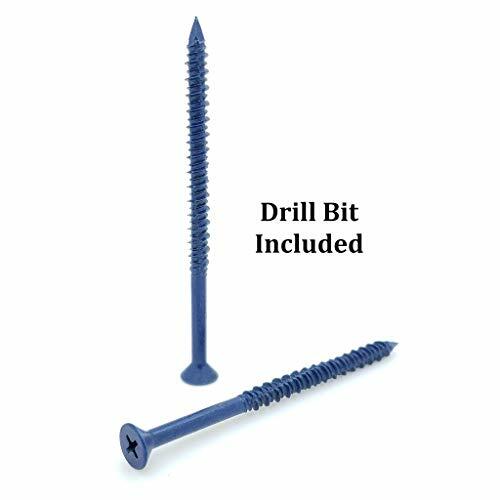 Included masonry drill bit is 5/32" size. Used to anchor signs, fixtures to concrete and block buildings. These Concrete Screws have received Product Control Notice of Acceptance (No. 15-0930.14) from the Miami-Dade Department of Regulatory and Economic Resources, certifying that they meet all Miami-Dade Requirements. 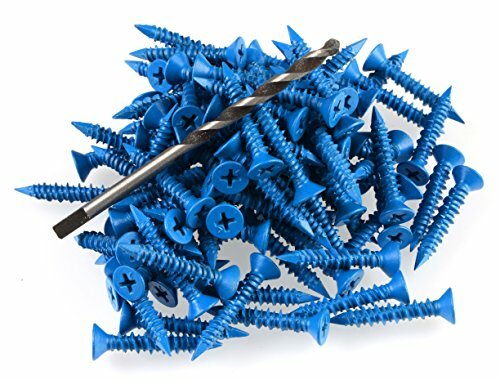 Corrosion resistance and long lasting performance due to the EnviroSeal blue coating Deep threads provide superior holding strength Great for anchoring items to concrete, brick, block, or other masonry materials The diamond tip allows for superior penetriating into hard materials Package includes 100 screws and a masonry drill bit Concrete screws are a special threaded screw, with hardened notched threads and high-low threads. 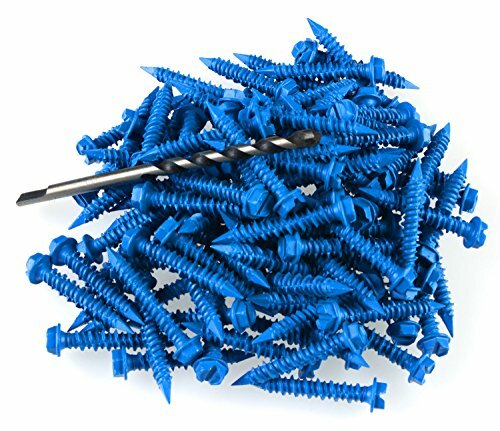 The notches and the high-low threads help to eliminate concrete shavings from the hole as the screw taps threads into the base material. 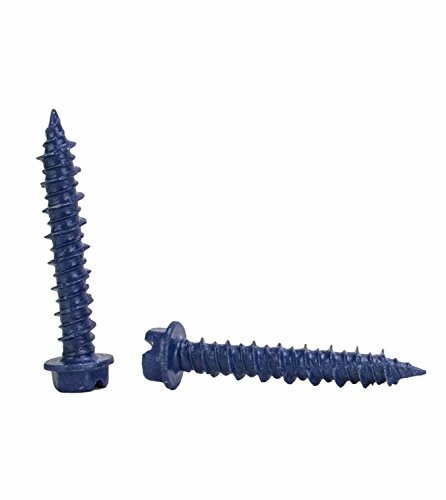 The hole size for concrete screws is smaller than the diameter of the screw. A 3/16" screw requires a 5/32" hole and a 1/4" screw requires a 3/16" hole. The concrete screw is inserted into the hole and turned either by hand or by a rotation drill until the concrete screw is tight against the fixture being fastened.